There is nothing more important to stand hunters than a safety harness. Plain and simple, it may one day save your life. There are a number of harnesses on the market, some are included with treestands, more effective models are sold separately and offer greater benefits of speed, comfort and protection. The old days of wrapping a safety belt around your waist are gone. Years of hunters found dead from suffocation have proven that the only safe way to restrain a fall is with a safety harness system which holds you upright and distributes your weight evenly so you can safely summon help or better yet - climb your way back onto your stand. When we first set out to create this feature we decided to limit harness systems to the two top models. The Seat 'O The Pants Supreme by Summit and the Hunter Safety Systems Bowhunter Model. Our goal was to test (and film) actual fall conditions and show you how both harnesses performed. It goes without saying that there is a significant risk of injury when performing this test. DO NOT TRY THIS AT HOME. We evaluated both Harness systems on the following Criteria and represented with a score rating of 1(poor) to 5(excellent). The results of this test are subjective, and based on my opinion and observations using both harness systems. Individual results may vary. Summary - The SOP has been considered one of the leading Harness systems for years and our tests would confirm this on the vest model as well. The design was simple to use and fast to put on ( however the HSS vest edged it out in this category). The design of the fall arrest system - which includes the safety rope/prusik knot along with a lockable carabiner - was easy to use and adjustable. It is also very quiet, with rubber coatings on all the buckles. But where this system shined was in the arrest and comfort during (and after) an actual fall. It was apparent that a lot of safety and comfort testing went into the design of this system. The additional features were icing on the cake. I especially like the ability to store the harness in the fanny pack, along with the ability to wear this vest under my clothing. Summary - The HSS Vest has received great feedback on our forums, along with some industry publications. 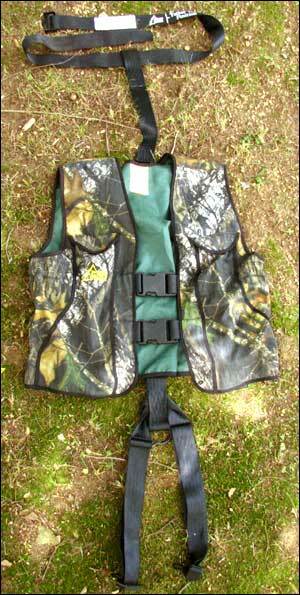 Hands down, this is the easiest vest to put on and eliminates any excuse for a hunter claiming harnesses are "too complicated." It took 30 seconds to put this vest on. I was disappointed in the tree strap - it was not as easy to use (nor adjustable) like the SOP system. The Vest is comfortable and versatile with lots of pockets. However during the fall test, I experienced immediate and intense pain from the crotch strap. It was so bad that I cancelled the subsequent tests for fear of a potential injury. I contacted HSS to see if they were aware of the problem and if they were considering a design change. There was none planned as of this writing. They suggested that perhaps I did not have the vest adjusted correctly, so I adjusted it per their instructions and tried again. I experienced the same results. I had invited them to send us a statement which is posted below. Below is a statement we invited HSS to provide for this feature. We have included it verbatim out of courtesy to HSS in response to our findings. Thanks for the feedback on the Hunter Safety System. Please know that since the company’s inception, it’s honestly been our intent to listen to ALL comments received from customers and consider them in our efforts to design and manufacture the best products possible. As avid hunters ourselves, the owners of the Hunter Safety System Co. join all our hunting comrades with the enjoyment found in new and innovative products coming onto the market. Likewise, we have also had to endure the hassles of other products that seem to take some of the pleasure out of the sport by making portions of it difficult. 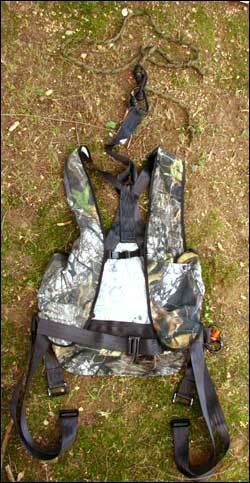 One such item that hunters have had to endure in the past is the safety harnesses that have previously been offered. First, let me say that there are many harnesses on the market today that are safe when worn. 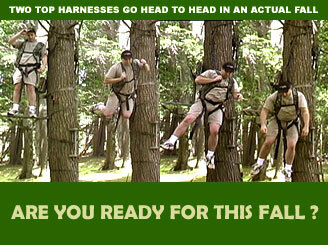 If installed correctly, these harnesses will prevent hunters from falling to the ground. But unfortunately, unless the harness is worn, it cannot be expected to protect the hunter. Prior to the Hunter Safety System, safety devices were either single belts or a tangled mess of straps that were difficult at best to put on. Consequently, our friends and we were forgoing the hassles of trying to put them on in the predawn darkness and rushing to our treestands without a safety harness at all. After much study, trial and error, we at the Hunter Safety System believe that we are able to offer a TMA (Treestand Manufacture Association) tested and approved safety system that is safe, comfortable to wear and easy to put on. Our design allows the hunter to put the safety system on in approximately 10-to15 seconds once it has been adjusted to fit correctly. Because of this ease of use and comfort, thousands of hunters who would previously never wear a harness are now protecting themselves and their families. Falling from a treestand can never be a pleasant experience. Regardless of the safety harness worn, the incident in itself is one that will likely never be forgotten. We at the Hunter Safety System have strived diligently to offer a safety system that combines comfort and ease of use with the most important factor of all, that of safety. Our TMA (Treestand Manufacturer Association) safety certification and the numerous awards received such as Field and Stream’s prestigious “Best of the Best” award as last year’s best hunting product don’t compare to the gratitude we’ve felt from the countless letters and E-mails we’ve already received from hunters that have fallen and been protected from injury or worse by the Hunter Safety System. To ensure our harness accomplishes the safety goals that we’re striving for, we include detailed written instructions in two locations within each package as well as a DVD that explains how to properly adjust the harness for safety and comfort. As an added part of our safety instructions, we strongly recommend that the hunter carry a screw-in type step that can be inserted into the tree that can be stepped on to relieve any pressure associated with hanging. We also recommend that the hunter carry with him/her a whistle, two-way radio or cell phone to notify anyone in the event of an emergency. Our leg straps are designed such that, in the event of a fall, they pull up and out in the direction of the outer thighs rather than into the crotch area. Additionally, once the straps located inside the vest portion of the harness are adjusted correctly, they too will share in distributing weight across the entire body. As I mentioned before, falling from a treestand is never a pleasant experience. With the Hunter Safety System on and adjusted properly, the hunter can feel that his/her safety is assured thus leaving the ability to continue enjoying the sport for years to come. We hope you and all your readers enjoy a safe and successful hunting season. V.P. Hunter Safety System Co. Hang On Stand, with Branches or Climbing Steps - When hunting from a tree that has branches, or climbing sticks, climbing steps, etc. It is important for you to set the harness strap position in a way that will drop you next to them - not on them. This allows you to swing and kick your way onto a foot step (or branch) and take the tension off the harness strap. Climbing Tree Stand - When hunting from a climbing treestand be sure to set the tree strap high enough that in the case of a fall, you dangle within reach of your stand platform. This will allow you to slide the platform down to your knees (not your feet). Once the platform is at knee level you can climb onto it and when you stand up it will create slack on the tree strap. We hope you learned something from these real-world tests and as usual - we wish you a long and safe lifetime of hunting seasons for years to come.